Missouri wineries are a great place to spend an afternoon, evening or weekend. There are more than 100 in the state and dozens within a short drive of St. Louis. Missouri wineries are among the nation's oldest, and a few are actually among the most award-winning. Area vineyards offer great views, hospitality and simple fun that make them a must-visit destination. Here are ten great wineries to try near St. Louis. Mount Pleasant Estates in Augusta, Missouri, is the oldest and largest winery within an hour's drive of St. Louis. But size and age aside, Mount Pleasant is also one of the region's most popular wineries. Certainly so for its breathtaking view of the Missouri River valley, but more importantly, because it consistently creates some of Missouri's best wine. It's Merlot, Norton and Vignoles are all award winners. Mount Pleasant is also a great destination for live music on the weekends. Missouri has a long history when it comes to making wine. German immigrants brought their grape-growing skills to the region in the 1800s. That history and tradition are on full display at Stone Hill Winery in Hermann. Stone Hill is known for its German-style white wines, such as its Vignole and its Steinberg White. It also produces a dry red Norton that's very popular. Visitors certainly appreciate its wine, but Stone Hill's also king when it comes to atmosphere. The winery's listed on the National Register of Historic Places. Its more than 160-year-old cellars are the nation's largest, and few Missouri wineries offer better views or as serene a setting. Hermannhof is another of Missouri's crown jewels in the wine industry. The winery's top feature, its beautiful courtyard, feels more like a Munich beer garden than a winery. Although that's no surprise; Hermannhof opened as a winery and a brewery in 1852. But before grabbing a spot in the courtyard, make sure to tour the winery's historic cellars and to sample its homemade German sausages and cheeses. What about the wine? Rest assured it's not only as good as any wine produced in Missouri, it's also a regular winner at prestigious international competitions. Top vintages include the dry white Chardonel, dry red Chambourcin and the dessert Port. Montelle Winery is like a hilltop retreat that happens to also make good wine. The winery sits atop the Osage ridge and offers some of the region's best views of the Missouri river valley. A multi-level patio and terraces with plenty of picnic tables let visitors settle in and get comfortable. Montelle flies under the radar when it comes to kudos for its wines. However, the winery won the 2008 Missouri Governor's Cup (best overall wine) for its Dry Vignoles​ and has certainly won its fair share of other medals over the years. In short, most visitors will find a wine they really enjoy. But Montelle's atmosphere may be what they remember of the winery years later. Little Hills Winery is a popular destination in the heart of historic St. Charles. Visitors come to Little Hills not just for wine, but also to dine. 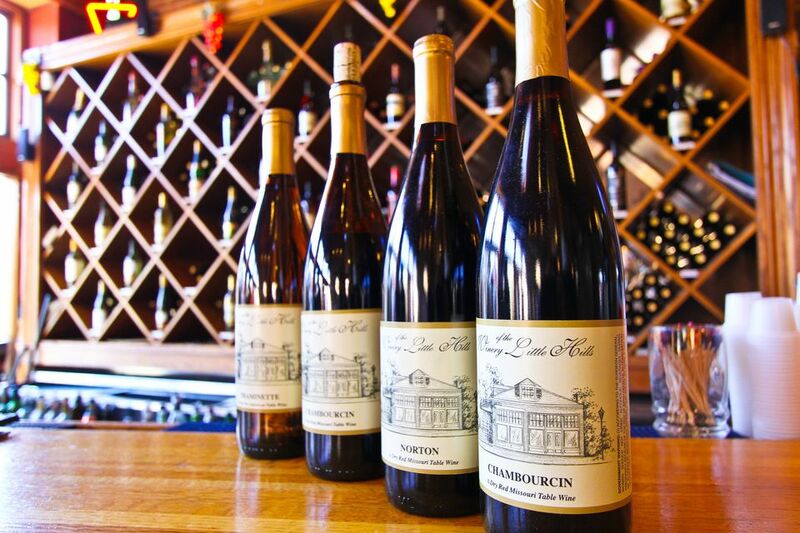 Unlike some other Missouri wineries, Little Hills has a full-service restaurant featuring an eclectic menu of American, French and Italian cuisine. On a nice day or evening, the winery's large outdoor patio is often filled with customers sipping the latest Norton or Vignoles while dining on beef tenderloin or lobster ravioli. The restaurant also serves burgers and salads for those looking for a more casual meal. There's also a wine shop just down the street where customers can buy gift baskets, wine accessories and some of the nearly two dozen varieties of Little Hills wine. OakGlenn winery has perhaps the best view of any of the St. Louis area wineries. Seating is atop a bluff looking directly over the Missouri river. It's also one of the best places to build your pride in Missouri's wine heritage. The winery's lands were once owned by George Husmann, considered a founding father of America's wine industry. In 1866, Husmann literally wrote the book on making American wine. OakGlenn's certainly proud of its ties to Husmann and builds upon that pride to suggest its wines are a notch above other Missouri wineries (with higher prices to boot). But they're certainly not stuffy. On most weekends there's live music and crowds in search of a good time. As the name implies, Cave Vineyard's claim to fame is a giant cave. But don't let images of dark, dank and gloomy dissuade you - the cave is spacious, well lit and usually pretty festive. During warm months, sitting at a table at the mouth of the cave is a cool (literally) way to relax and enjoy the summer. On evenings, candles and the clink of wine glasses actually make the cave quite romantic. Live music and other events are also common during weekends and for many holidays. Even if the wine wasn't great, Cave Vineyard would still be worth a visit, simply as one of the most unique winery settings in the state. But luckily for wine connoisseurs, Cave Vineyard has its fair share of top-notch wines. A visit to Bommarito Estate Almond Tree Winery may feel like a visit to your eccentric uncle's house who makes wine as a hobby. But that's a good thing. Bommarito is one of the area's smaller wineries, and it's the pride and joy of Nick Bommarito and his daughter Cathy. It's common to find one or both manning the tasting counter, and when that's the case, you wonder if they're in this just for the chance to sit behind the counter to swap stories or tell jokes. The Bommarito Winery's also unique in Missouri in that it's based on Italian winemaking techniques, rather than German. So make plans to visit your Sicilian uncle Nick and taste some of his award-winning wines.